The Resource Centre is a small library of Christian books, magazines, tapes (audio and video) and audio CDs, which are freely available for use by all who attend or visit the chapel. It is hoped that this web page (as it is developed) will be an extension of our Resource Centre, identifying material and especially resources on the World Wide Web that we trust will be a blessing and help to you. Around 1,500,000 Sermons to choose from on this site. All are free, but you do need to sign up to receive their weekly email before you are able to download (no other emails will be sent to you) - the email contains latest and recommended sermons and advertising which helps pay for the site. Recommendation: Use the Links listed on the left edge of the SermonAudio web pages to browse the site. You can become a 'Plus' or 'Full' Member of the site, for a fee, but this is not necessary to download sermons - see the About Our Services page for details. All Broadcasters must sign up to the site's Articles of Faith. Use the MENUS at the top of the new StudyLight web pages to browse the site. The Study Light site also has a Statement of Faith page. It is a good idea to check out the statement of faith or equivalent when browsing "Christian" sites - there are many organisations that call themselves 'Christian' and provide 'Bible study material', BUT do not hold fully to the teachings plainly stated and oft repeated in the Bible itself. Another good source of MP3 audio lectures and sermons plus lecture study notes. The next best thing to going to Bible College yourself - To see the complete list of Free Courses Click Here. and go to RESOURCES. To access the material it is now necessary to register with the site, but it is still free. CARM is a nonprofit organization whose purpose is to equip Christians and refute error. It is well documented. Come here and learn about false teachings such as Mormonism, Jehovah's Witnesses, Islam, the New Age, etc., as well as provide counter arguments for evolution, atheism, relativism, abortion...and much more. In their own words...."bethinking.org is a website that aims to put the best Christian thinking and communicating resources right into your hands. Whether you are a student, at home or at work we want to help you to talk about the Christian gospel in a way that is relevant, true, culturally aware and attractive. There are hundreds of interesting articles and audio talks on bethinking.org for you to use and think through." The Bible - wider questions about what it means for the Bible to be God's Word, whether it can be relevant to us today and how the contents of the Bible were decided. 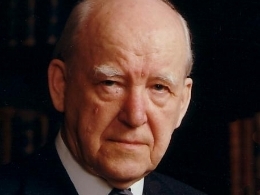 One of the most popular authors on our church Resource Centre bookshelves is Dr. Martyn Lloyd-Jones. Click in the picture above to go to the 'OnePlace' web page where you can hear or download some of his sermons. In 2012, the Martyn Lloyd-Jones Trust in the USA : http://www.mljtrust.org/ made available 1600 of Dr Martyn Lloyd-Jones sermons. Until very recently these were only available for purchase (with selected sermons via One Place), but now they are amazingly free - by far the best offer on the Internet. Actually, there is a far better offer - it is the one expounded in these serrmons. Redeemer Presbyterian Church, is a church with a vison: "To spread the gospel, first through ourselves and then through the city by word, deed, and ommunity; To bring about personal changes, social healing, and cultural renewal through a movement of churches and ministries that change New York City and through it, the world." You might be interested to follow the links on its web site to investigate what that means, starting at its Home page (Click Here and the 'About Us' menu). MP3 Sermons on the 'Core Values' of Redeemer Church by Tim Keller. Tim Keller (founding Pastor of Redeemer Church) on Monergism.com. Tim Keller MP3s on Monergism.com. Grace To You features the ministry of John MacArthur. Learn more about him on the US web site HERE. 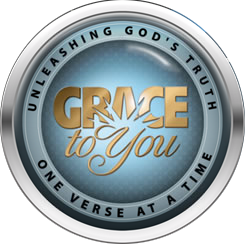 You can listen to Grace To You on your radio or television - DETAILS HERE. View a video introducing Grace To You HERE. Another wing of UCCF (see bethinking.org above), this web site is packed full of exciting Theology. If you don't think Theology is exciting - think again - and explore this web site. There is plenty of very well presented Church History too. Listen to Mike Reeves on Luther in the "Unquenchable Flame" Category. Mike Reeves in any of the Categories - he is UCCF's resident theologian and often speaks at Universities. Find Don Carson in the "Studying Theology+RS" Category. Learn about some great men of history in the "Historical Theology" Category. The "Table Talk" interviews are very good also. This is a most excellent organisation and its web site well reflects its quality and integrity. It is a real gold mine of Resources and News/Comment. "The Christian Institute exists for “the furtherance and promotion of the Christian religion in the United Kingdom” and “the advancement of education”. The Christian Institute is a nondenominational Christian charity committed to upholding the truths of the Bible. We are supported by individuals and churches throughout the UK. We believe that the Bible is the supreme authority for all of life and we hold to the inerrancy of Scripture. We are committed to upholding the sanctity of life from conception." Another excellent organisation or two. Read the About Us page for an introduction. They also produce booklets that can be downloaded.